Light and airy flexible accommodation with disabled access, stage, WIFI, and kitchen. With direct access to the Pavilion, changing rooms, recreation ground, and car park. with the main hall (extra charge applies) or by itself. With separate outside access to the recreation ground. KITCHEN with; oven, hob, microwave oven, dishwasher, fridge, freezer. crockery and cutlery to serve 100 people. 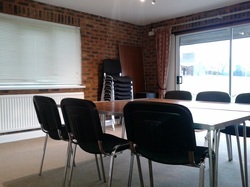 ADDITIONAL MEETING ROOM, with own kitchen/ bar area changing rooms and showers.